Being extremely busy with trying to get ready to the Ol Time Edinburg Festival and being away for a week in Seattle, I didn’t give my fairy garden the water that it needed and so one of the larger plants died. I also think there may have been an air pocket in that back corner of the planter where the plant wasn’t getting the water that it needed when I did water it. SO, I wanted to get it ready to take to the Festival in Edinburg this past weekend and I didn’t really have the funds to go and purchase a new plant so I thought I would share how I went about redoing the planter, at least from the planting perspective so that you can see my approach to a new look and a refresh of items in the planter. I took out all the ceramic decorative items first and put them aside. Then I took out all the plant material. So now, with a fresh canvas to work on and I can decide the new direction for the planter using plant materials that I still have and add some from my yard. My first thought is to take the boxwood and make it the feature plant and center it in the planter with the smaller plants on either side. At this point I haven’t scouted out the yard for something to add. Autumn Joy, and thought that would give me some forest like stems but would also add some color for the festival. I have several planters of this in the yard in addition to having them in some of the flower beds so I had plenty to spare. I divided the sedum and took some and put in the planter. At this point, the boxwood needed to move to the right of center and the sedum goes on the left. The smaller cypress that I still had could then become a small tree in the yard area between the houses. Then I put all the elements in place and stepped back to take a look. I didn’t like it. It looked too much like the old version. 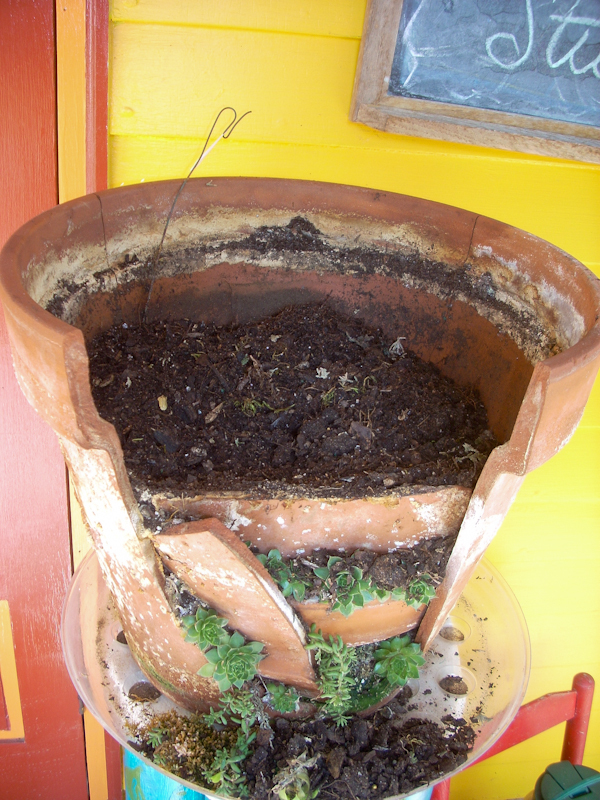 I wanted it to have a different flavor, the sedum just wasn’t working for me and it was a bit too floppy in the back. So I took it all out and started again. 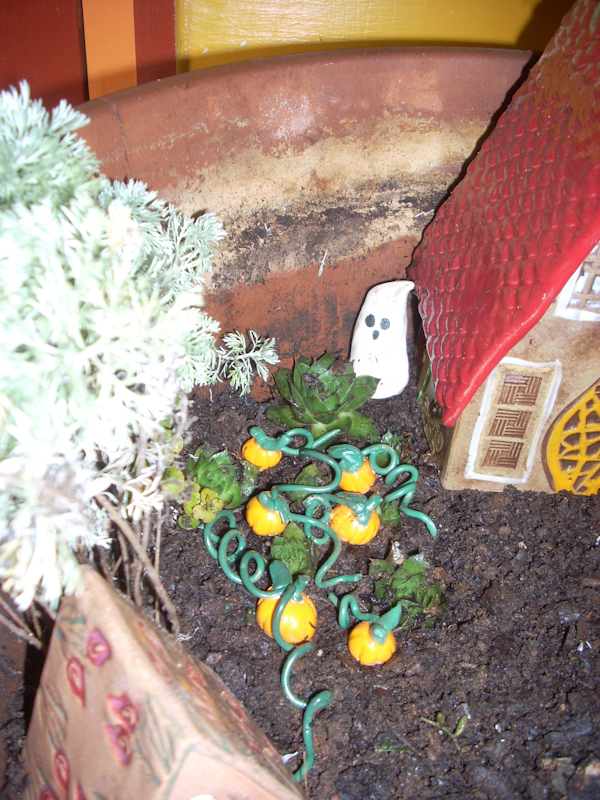 Instead of trying to add a new plant, I decided to showcase some miniature pumpkins that I had made for Fall and thought it would be fun to add a small pumpkin patch between the houses. This also meant that I needed to move the smaller cypress toward the back to allow for the garden space. I also found that I had some artemisia in a concrete planter in the front of the house that I could use as filler behind the small house to cover that back wall, give it a better scale than the sedum and add a new feel to the small house. This now works for me and I could add a few of the ghosts that I made to compliment the fall Halloween theme. I moved some of the hens and chicks both from this planter and from some in the backyard to plant with the pumpkins and they look like mini cabbages or heads of lettuces. I tried to plant them in rows, much like a garden would look. 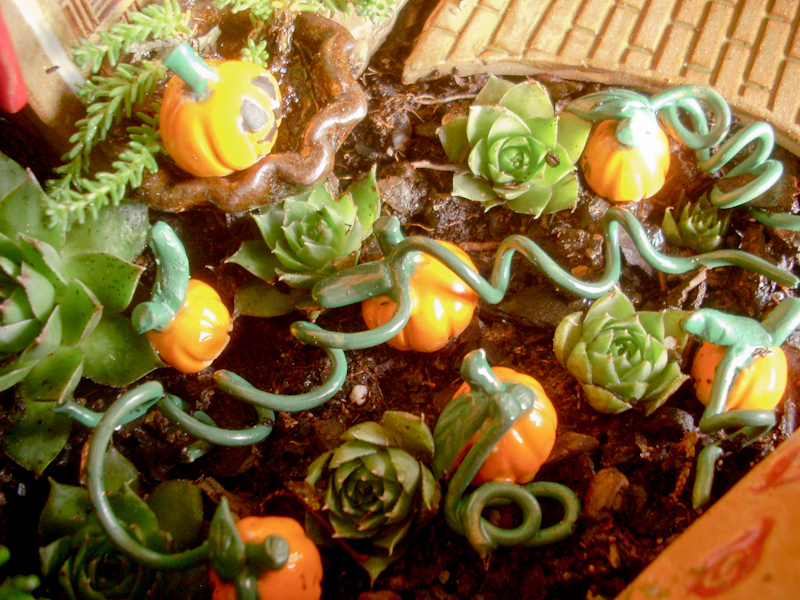 The mini pumpkins have small curly pieces of clay to mimic the vines that they grow on so that added the look and the hens and chicks filled in the space. I like this! Now to just put everything else in to finish it up. 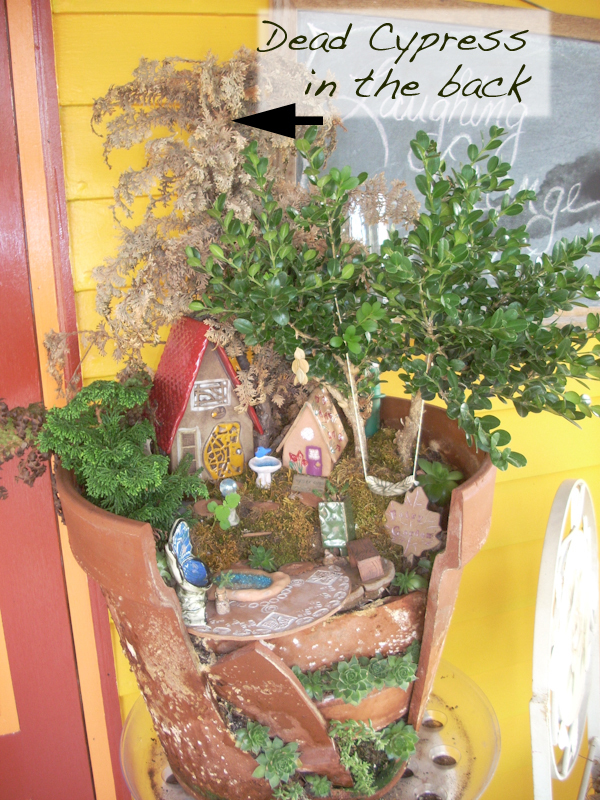 If you look closely, you can see that I put a fairy garden sign in the seam that is in the lower front of the planter. The blue butterfly chair is just a leftover that will go away, and I took some stepping stones to add to the seams on the left to add some interest where my hens and chicks haven’t filled in yet. 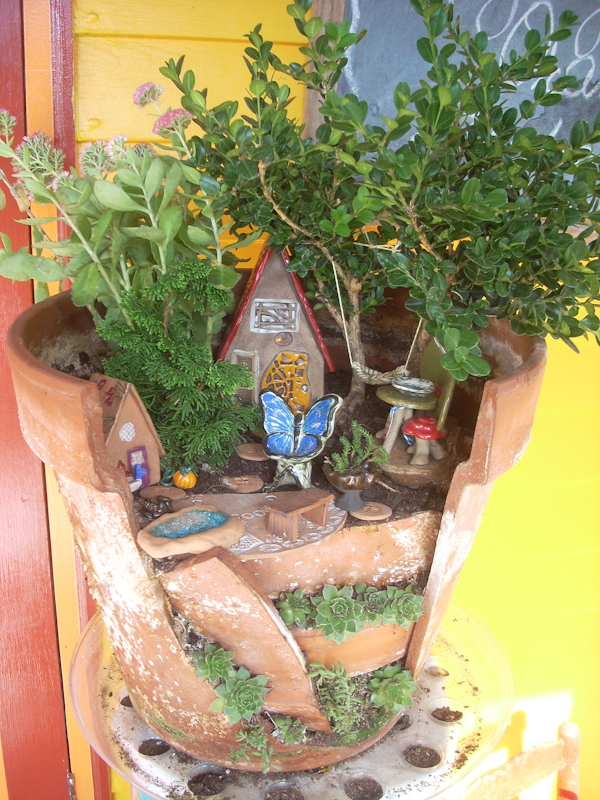 So, enjoy the redo of my fairy garden and don’t forget to water yours or you will be doing yours over too. I think it is fun to remake it for the different times of the year, but I don’t really want to kill the plants to do that. 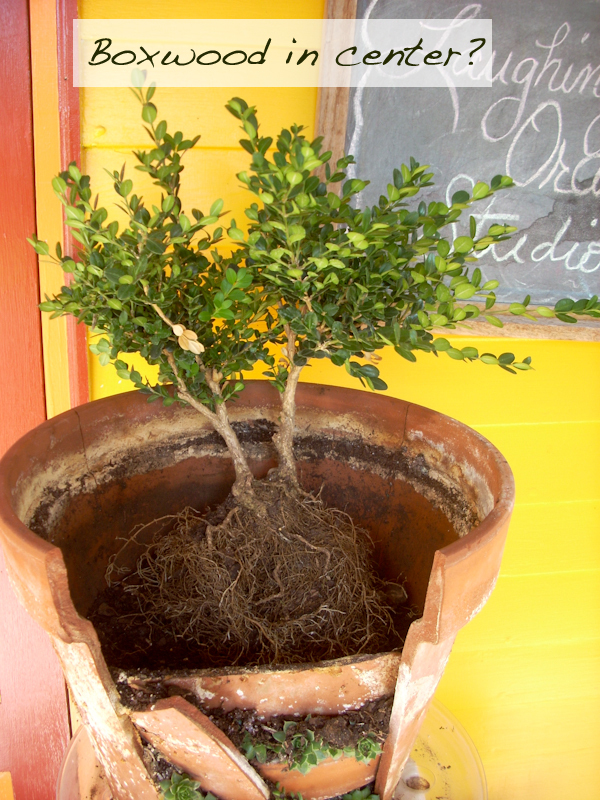 Changing the elements is certainly easier than a replant to get a new look, but you may still need to trim the plants or take them out if they get too big. The key to them getting too big though is to add water, which I seem to forget to do. Maybe I need to hire a new fairy to take care of that for me.